First off, Happy Halloween! Picture obviously not related. Yurika has a dream in which she’s a princess and Choco’s a witch. They’re attacked by Makoto and numerous scantily-clad women. Choco can’t protect her because her notebook doesn’t say how to use magic, but Yurika is saved by Kakeru the knight. 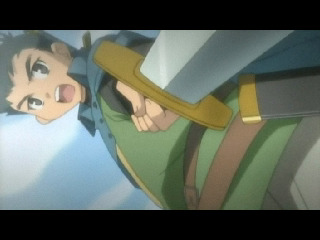 He cam for her sake, or so she thinks, but she and Choco have switched roles and Kakeru is about to kiss the princess. In school, Yurika’s teacher notices that she looks unhappy and gives Yurika the idea of hosting a tea party. Having her ulterior motives, Yurika decides to do so. While in gym, Yurika fantasizes about the tea party, imagining Kakeru being there and in love with her and Choco being ignored. Not paying attention to the real world, she smashes her head and has to go to the nurse. The nurse asks her what’s wrong and suspects that Yurika’s been thinking about love. She denies it, to the nurse’s amusement. Meanwhile, Haruma is working at a restaurant. Tamami comes in, irritating him for a bit. It’s pretty obvious that she gave him the job. Later, Yurika informs her maid about the tea party, followed by Choco. Choco has no clue what Yurika’s talking about. She think’s since it’s an English tea party it’s actually going to be in Britain. Yurika tells her that it’s going to be at her own house. She invites Choco and has a very hard time telling CHoco to bring her “friend.” Choco figures out what she’s trying to say and graciously accepts. Later, Choco gets stuff ready for the party. Haruma also thinks for a minute that she’s going to Britain, but that’s only because of the way Choco words it. Yurik prepares as well, trying to find a suitable dress. The doorbell rings and she’s very nervous about answering it. It’s Choco and she did bring her friend… though by “friend” she thought Yurika meant the kids from the school whom she was friends with. The kids are enjoying it, but Yurika obviously isn’t. She’s forced into a game of onigaku, which is kind of like hide-and-seek, but all the kids manage to convince the mansion staff to help keep them hidden. Exhausted, she stops for a break but discovers feet behind a curtain. She thinks it might be a trick, but then it moves. Behind the curtain was Choco, who fell asleep. Eventually, everyone leaves. Choco writes about the day in her journal. That night, Yurika has another dream. This time she’s sleeping beauty, the kids are the dwarves, Makoto is the witch and Kakeru is of course the prince. Yurika, who was only pretending to sleep, is pleased that the kids are convincing Kakeru to kiss her. 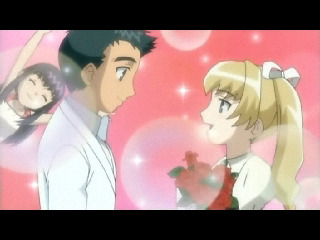 However, the person who kisses Yurika turns into Choco. Too funny! I had completely forgotten about this story, but I’m glad it was included in the anime. While essentially nothing was accomplished, it was just brilliant comedy. Yurika’s dreams were quite funny, especially the second one. I love how Makoto was always the villain. She is pretty evil sometimes. It’d be great if Yurika could catch a break for once but I doubt that will ever happen. This episode was just full of torture for her. At least she’s been getting a lot of screentime, so I’m content enough. Next week is the continuity of the Neko Nyan dance story. The preview was sickeningly cute itself, so I can’t wait to see how adorable the full thing is. @ Haesslich- It’s in volume 4. After checking the site, I noticed that more of volume five was released. Cool!